Just in case you’ve been living under a rock, there is no better rock to be living under than Fallingwater, located in the Laurel Highlands of southwestern Pennsylvania along Bear Run. Where else could you retract a glass floor to walk down a set a stairs from your living room, and soak your tired feet in running water spilling over rolling rocks? With stone quarried on site, and repeated themes of cascading concrete terraces that cantilever throughout the structure to resemble nearby rock formations, I can’t imagine another residence anywhere that is so bound by its natural habitat. Fallingwater is considered the finest piece of mid-century architecture anywhere, and it’s a treat to tour the house from the perspective of the Kaufmann family, who commissioned Frank Lloyd Wright to design the retreat at the age of 70 in 1935. Completed in 1937 for $155,000, Wright frequently battled with Edgar Sr.–a Pittsburgh department store magnate–to preserve his purist design. While the family respected Wright’s vision and artistic integrity, moreover, they wanted a house that would work for them–a house that they could live in. And so, Wright, who was at the nadir of his career, and famous for his unwillingness to compromise, held his breath and took on a client who had an equally strong idea of how his house should function. That they would survive such a contentious relationship for the sake of art and design is a testament to patron/artist symbiosis. 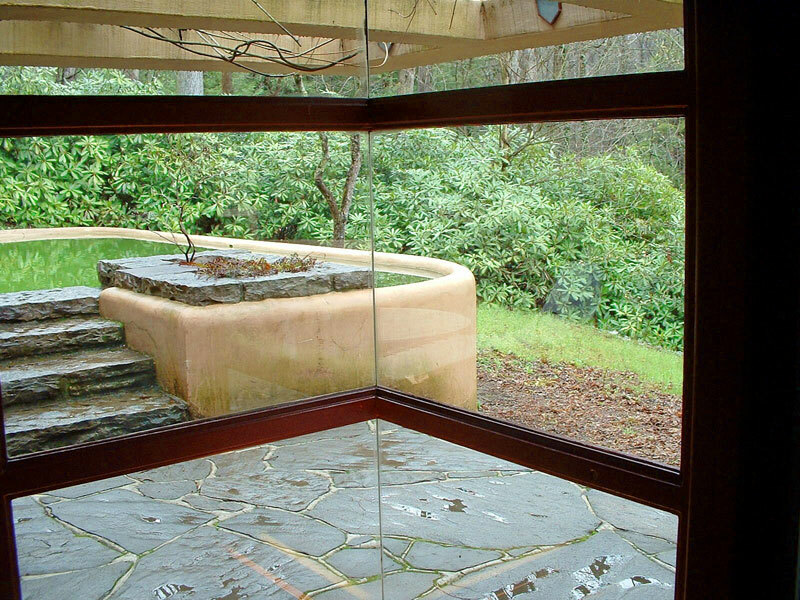 The sound and smell of water is omnipresent from room to room. 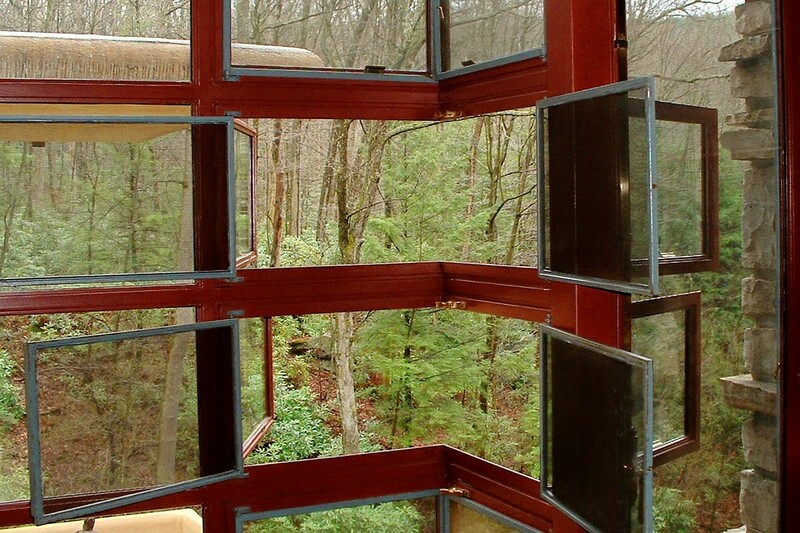 There are no blinds or drapes that would rob the senses of scenic vistas–only walls of glass that seam at the corners, or more miraculously, windows that hinge without a trace of interruption. Much of the furniture is built-in, and would seem uncomfortable, as if to suggest to the tenant that it’s motivation is to drive you outside, where nature is always the winner. But there are touches of warmth as well, including a massive fireplace with a swinging cauldron that could easily provide gallons of hot toddies when pulled into the fire, and bathroom walls and floors lined in cork. The steel beams that buttress the building are colored to respect the outcroppings. 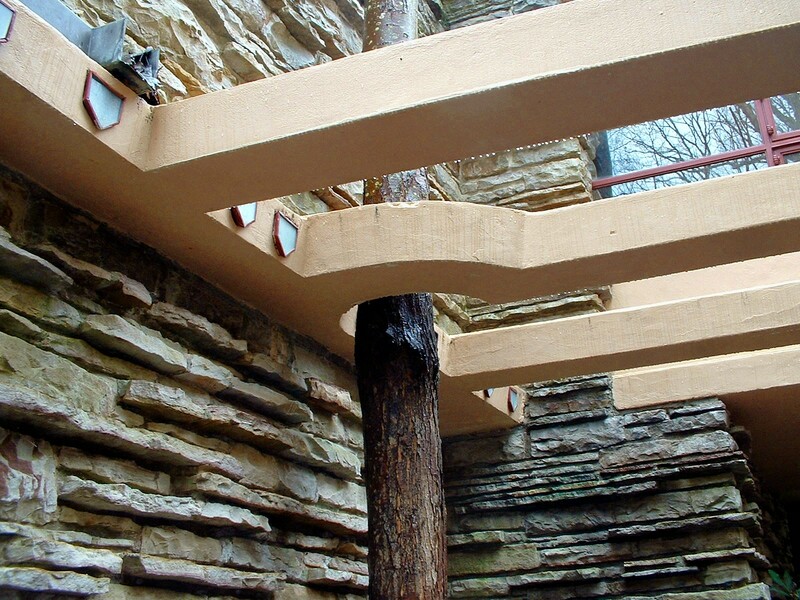 And other beams are playfully conversational and conservational. The notion of unifying form with function is always contentious. The language of one easily dominates the other, leading to certain confusion and discord. But if both sides listen at the same time, and hear the quiet between the noise of overlapping voices, then something wonderful happens, and it’s called Fallingwater. Is it the kind of home you could see yourself living in? How did it feel? The connection to nature is awesome, but it seemed far from cozy. The guest house attached to the main house by cantilevered walkway felt more user-friendly. There’s a Bunker in the Hill, and It’s Revolutionary!